Material: Enough Kinder Eggs (or plastic eggs) or film pots or enough matchboxes. 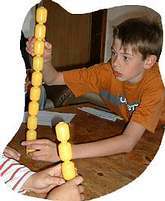 The highest free standing tower possible is built using 15-20 Kinder egg containers. The containers can be stuck together but the tower must stand without any assistance for 60 seconds. Instead of Kinder Eggs you can use 20-30 camera film pots or 30-40 matchstick boxes. The number of containers making up the tower are counted up. They can only be counted when the tower stands without falling over. Maybe less is more.